Some 1,345 flights were canceled at Chicago’s O’Hare airport Sunday as a winter storm swept through the Midwest on its way east, threatening to bring more snow to parts of Ohio that have seen nearly three feet. Flight-tracking website FlightAware reported that 1,345 flights were canceled in Chicago’s O’Hare and Midway airports — about half arrivals and half departures. Midway announced on Saturday that all Southwest flights would be canceled into Sunday morning due to the winter storm. Chicago could see a total of 7 to 12 inches of snow, the National Weather Service said, and it and the region was under a winter storm warning through Sunday night. The city was bracing for plunging temperatures that are expected to send the thermometer to around 8 degrees next week. “This is certainly going to be the coldest air this year,” Weather Channel meteorologist Kelly Cass said. A swath of the country from South Dakota to Vermont was under a winter weather advisory early Sunday, the weather service said. The storm could bring up to 7 more inches of snow to the coast of Lake Erie in Ohio. In Kirtland, Ohio, east of Cleveland, nearly 33 inches of snow had fallen over the course of the storm as of Saturday morning, the weather service said. Another batch of winter weather that hit the Pacific Northwest Thursday and Friday sent freezing rain into Portland, Oregon and caused power lines to go down all over the city. The city’s fire and rescue service said it responded to 378 emergencies into Friday evening, and on Saturday it rescued around 100 people trapped on a darkened train after a high voltage line was downed. The Midwestern storm is forecast to spread into the Upper Midwest and into the Northeast Sunday, bringing snow to the Northeast by Sunday night, the Weather Channel said. 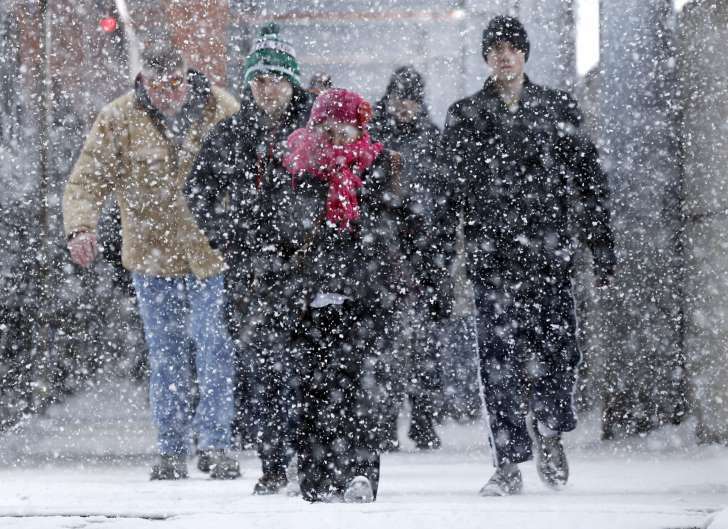 Snow was expected to continue falling in the Northeast Monday through the evening. While New York City could get snow early Monday, it is more likely to turn into rain, forecasters said. Around 3 inches could fall north of the city, throughout Connecticut and in Boston by the time it’s all over, forecasters said. Another round of snow was in store for the Pacific Northwest and the Plains this weekend. By Monday, snow totals will reach as much as 2 feet in some parts of Washington state, Oregon, Idaho, Montana, Colorado, Utah and Wyoming, The Weather Channel reported.